Derby Days - Fabric Shoppers Unite! 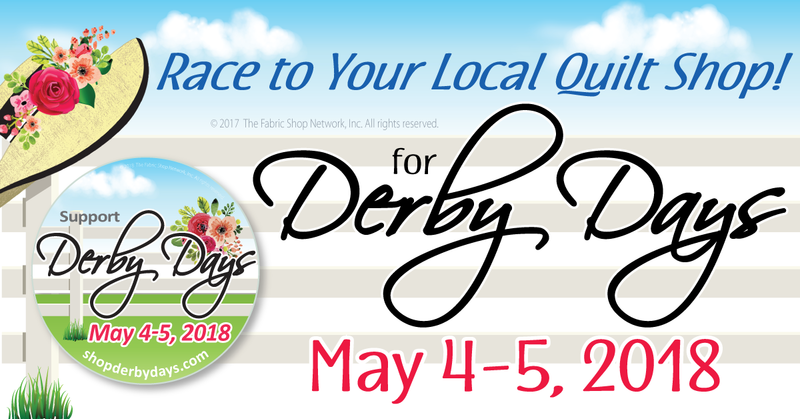 Derby Days – Race to Your Local Quilt Shop is a themed event designed to coincide with the running of the the Kentucky Derby and Oaks. It is a time when quilt shops and those who love fabric can have a little fun, celebrate the joy of spring and help to raise awareness of the importance of small businesses (and quilt shops in particular) to the local economy. This event is a chance to celebrate quilting in all its forms while supporting your local quilt shops. We hope that quilters from around the world will make it a point to visit their favorite independent local quilt shops for the festivities they may have planned. This event, celebrated annually on the first weekend in May, will be held in 2018 on Friday and Saturday, May 4th and 5th. Derby Days is brought to you by the team at The Fabric Shop Network.